When I first arrived in India in 2007, there wasn’t much of a street art scene. I knew it was just a matter of time, though. Here are some of my favourite not-so-well-known pieces around the city. I consider this a real gem. It’s created by the world’s most celebrated street art duo known as Os Gemeos. They hail from Sao Paulo, Brazil. Their street name means “twins” in Portuguese and that’s exactly what they are. Twin brothers Otavio and Gustavo Pandolfo came down to India in 2008 and left behind this gem. They are known for their characters and this piece has their signature style pulsing with Brazilian influences all over it. The Tate Modern, Miami Art Basel and other prestigious art institutions have commissioned the brothers to create massive murals around the world. Perhaps we’ll be so fortunate to see their work at such a scale here in India. The reason why this piece that I consider an art relic is hard to spot is because it’s fading away and tucked away in a small area under an overhang. In an area where I’d least expect to see some street art, I found Bond’s monochromatic piece. Once I spotted it on my way up to Mount Mary from the Band Stand promenade, I succumbed to take a photo in front of it. 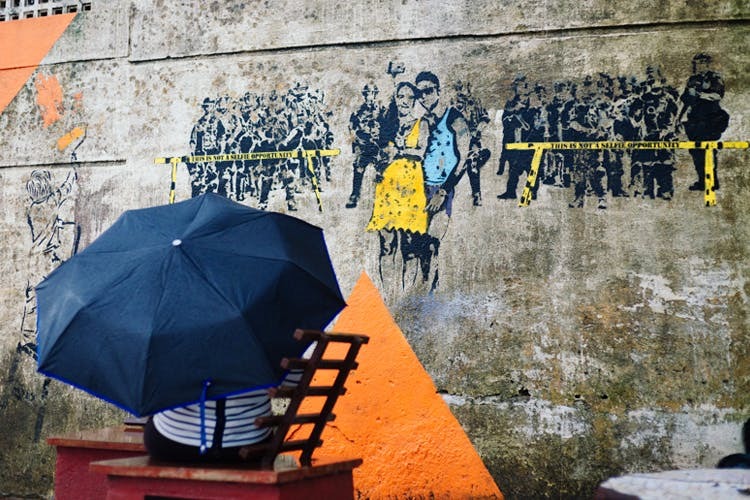 A few Bond pieces can be spotted throughout out Mumbai thanks to St+Art India who brought him over from Germany. One can usually recognise his work as he transforms his name into a work of art, using a different style each time. How to Find It: If I’m walking down the hill from Mount Mary Basilica in Bandra West, I miss this black and white piece. I have to walk up the hill from the water and only then do I find it on my right. Outside of Gallery Maskara I found a sweet playful piece of a girl hanging upside down from a branch, her hair becoming the waves below her. This was created by Nina (aka Nina Pandolfo) who also happens to be married to one of the Os Gemeos twins. She was flown down to India in 2008 to do an art show at Maskara and while there she painted this. I love it for its colours and childlike innocence. Others will like it for the same. It’s beautifully done. Then there’s this clever piece by Mumbai’s Banksy, the anonymous Tyler. Months before the Mumbai Police enforced “no-selfie zones”, Tyler created this work with his usual dose of irony. Tyler is fast gaining respect and recognition from abroad. Finding a Tyler piece around Mumbai is always a win for his growing number of fans. I love this piece as it sits in an area where I find people clicking selfies all day long in front of SRK’s house. This lovely piece was a collaboration between Inkbrushnme (aka Harshvardhan Kadam) and Drift (aka Sachin Shetty). I prefer the work of Inkbrushnme whenever he sticks to just one or two colours. This piece is so cool. I love dragons and people will love how they used the space to create a long piece. The red and white makes a beautiful backdrop for those who want to take pictures with the art. Since this street piece is in a tight alley though right off Carter Road, many people just drive past it without noticing.